Spirits were at an all-time high at tip off as Concordia took to the court ranked fourth in the nation for the second week in a row. The Stingers women team have not been ranked nationally since 2011. Yet, that presented no challenge for the players or head coach Tenicha Gittens. 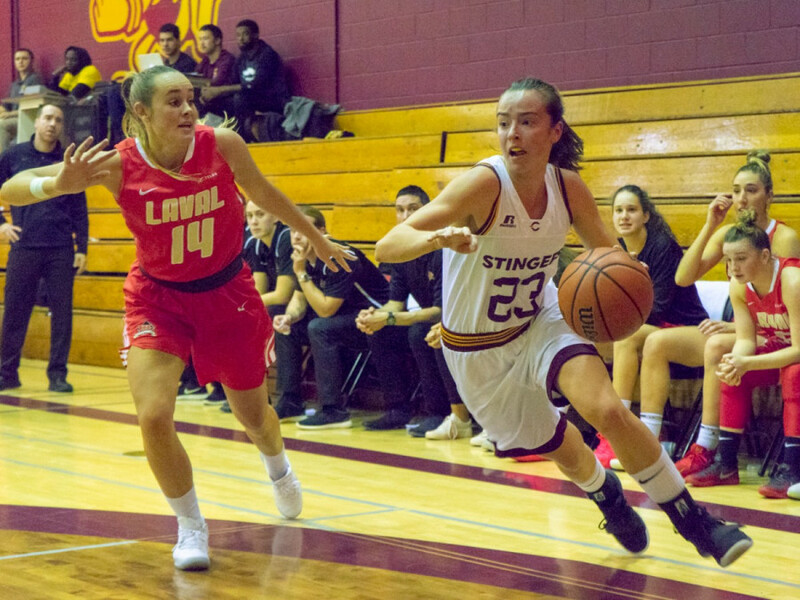 Led by two first-years, the agile shooting guard Myriam Leclerc and aggressive point guard Areej Burgonio, the Stingers did not leave room for the Rouge et Or. Jumping on defensive rebounds and moving the ball around the court offensively, they managed to create enough of a small lead by the end of the first quarter. Concordia led 21-13 as they entered the second quarter. It’s during the second quarter that the players really took off. The Stingers saw a number of fouls from the Rouge et Or and took advantage of the free throws, netting ten out of the 16 taken. Coupled with the fouls, the players demonstrated their great chemistry on the court as they got into the gaps with a number of pump-fake to pass and back passes. “It’s so nice, we are like a big family, like sisters. Whatever we do, we have each other’s back,” said Leclerc. However, the Rouge et Or took the better of the team during the second half. Not able to catch the offensive rebounds, Concordia only found the net five times compared to ten for Laval. According to head coach, Tenicha Gittens, the team was not able to run by the three-points line like in the first half. Gittens, like the players, knew that the lead Concordia was benefiting of by the end of the first half means nothing against the number one team in the country. “We knew we were going to have a big game, they are number one in the country but for us it doesn’t mean anything, we just need to beat them,” said Leclerc. It’s bitter to lose a 20 point lead but Gittens is not worried for her players. “The girls have always fall short [against Laval] and they got a really bad taste in their mouth but they are gonna do everything they can,” said Gittens. As the third quarter ended, the Rouge et Or were closing the lead rapidly with 55-44. A turn of event Gittens was no surprised to see. “We did a lot of good things but just not enough. Our conference is one of the strongest conference in Canada and so we have to bring it every single day,” she said. With only 6 points scored in the fourth quarter opposed to 22 from Laval, the Stingers fell short as the season opener ended. Yet, Leclerc and other players are excited for the season to begin as they continue to better themselves mentally and technically. For the rest of the season the Stingers don’t limit themselves to small hopes, “National Championships, that is the goal!” said Burgonio. The next game for the Stinger will be Thursday November 15 at 6:00pm against Université du Québec à Montréal at the Centre Sportif de l’UQAM.